Saturday 15 June 2019 9.00 am. to 5.30p.m. (doors open from 8.30a.m. The theme this year is Creativity and Innovation:Research and Resilience in Zimbabwean Arts and Science. The Britain Zimbabwe Society´s Research Day this year will explore the findings of researchers and practitioners in the achievements, challenges and futures of Zimbabwean innovation and creativity. Arts and culture, science and technology have demonstrated extraordinary resilience through times of turbulence and the most difficult economic and political circumstances in the 20th and 21st century. Key questions arise about identity, national and social recognition, finance and livelihoods, education and development, and the role of research. DR GEOFF BANDA, lecturer on global food security and innovation at the University of Edinburgh, on the innovative TIBA Partnership (Tackling Infections to Benefit Africa) and pharmaceutical manufacture in Zimbabwe. DR JULIUS MUGWAGWA, assistant professor on innovation and development at University College London, on how innovation can stimulate Zimbabwean economic recovery and growth. DR ROSELYN MASAMHA, Faculty of Health and Social Care, University of Hull, exploring innovation amongst the Zimbabwean diaspora. LISA SIDAMBE, programme director on global affairs for the Nhimbe Trust in Bulawayo, on Nhimbe Trust´s promotion of cultural policies for Zimbabwe that nurture creativity and recognise its vital role in development. ROB LEHMANN, head of participation at the Young Vic Theatre in London, on the Young Vic´s exchange programme with Nhimbe Trust. LENNON MHISHI, postdoctoral research associate at University of Liverpool, inter alia exploring how the arts and humanities can be used to tackle contemporary slavery in sub-Saharan Africa. Watch this space for information updates as the programme takes shape – ask to be added to our Research Day mailing list. We look forward to welcoming you to Research Day 2019. Saturday 27 October 2018 2.00p.m. to 4.30p.m. All members and perspective members are invited to join us for this year’s AGM followed by a round table discussion on Zimbabwe. The AGM opens for registration at 1.30p.m. and includes also the election of new officers for the Society. 3.15p.m. “What now for Zimbabwe” A post- election opinion .Speakers to be confirmed. Join the International Peace Project for a talk by Dr Z W Sadomba (University of Zimbabwe)on Saturday 19 May 2018 12.00p.m. All Saints Church,WestbourneRoad, Queen’s Park, Bedford MK40 4LD. If you are a paid up member you can join our BZS Whats App discussion group. This App is available on any phone but also available for desk top access. This we hope will keep members rapidly in touch with developments,and national activities in the Uk and Zimbabwe . Please be aware that members with a wide variety of views may target this group and that it does not represent the opinions of the Britain Zimbabwe Society but only of the named individuals. Please avoid defamatory comments and material that has no intellectual or promotional merit. You may be deleted from the group without warning if you have not kept up to date with your membership. 07763 305905. Please double check you have the correct number before you send. If you want to avoid being irritated by constant pings to your phone these audible notifications can be switched off on your hand set. You can also choose your own ping sound for BZS notifications so as not to confuse them with other such events. 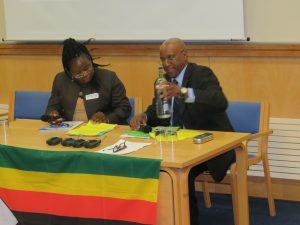 This is the developing word press site for the Britain Zimbabwe Society. The Britain Zimbabwe Society (BZS) was established after Zimbabwe’s Independence in 1980 to share information, promote friendship and facilitate networking between the two countries. In addition BZS organises a BZS Research Day annually in June, to highlight research by academics on Zimbabwe both in that country and in the Diaspora. A Review with details of newly published books, economic reviews and articles of general interest, is published three times a year. Membership of the organisation provides access to BZS Information which promotes news and debate on the current situation in Zimbabwe and events linked to Zimbabwe. For further details on joining the BZS please consult the information on membership provided elsewhere on this site. We hope to see you all in October for the AGM in London which is attended by a full programme of speakers. Watch this space. Still a few days to register to attend on Eventbrite:https://www.eventbrite.co.uk/e/staying-alive-in-zimbabwe-tickets-33048520013 and you can also register on the day. A reminder that the Research Day programme includes a book launch by Marieke Clarke and our guest speaker Pathisa Nyathi, of their biography of Welshman Mabhena, published in Zimbabwe last year and now available in the UK through African Books Collective. Marieke and Pathisa will be signing copies and the book will be on sale from the bookstall during the refreshment and lunch breaks on Saturday. “Welshman Hadane Mabhena: A voice for Matabeleland” was written by Marieke Faber Clarke with Pathisa Nyathi and published by Amagugu Publishers, Bulawayo, September 2016. The book is distributed in the UK by African Books Collective. the role of Governor in 2000. He died at home in 2010 and is buried in Bulawayo. Just in case you might not make our AGM (see below)please take a look at theBZS Research Day overview_2016 of this year’s Research Day and plan to attend in 2017!